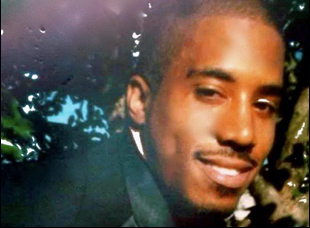 On how the death of Dontre Hamilton inspired a movement. Though you never really feel the presence of a camera except in that moment in “The Blood is at the Doorstep,” you can understand its power throughout. For three years, Ljung observed the fallout in his hometown of Milwaukee from the inexplicable shooting of Dontre Hamilton, an unarmed African-American man in the middle of Red Arrow Park in broad daylight, at the hands of the police after responding to a report of a vagrant disturbing the peace. Naturally, the film chronicles the outrage that emanated from the killing, made worse when police began to use Hamilton’s diagnosed paranoid schizophrenia as a justification after the fact for handling the situation as they did when in fact their own protocol would suggest otherwise, but Ljung also captures the inspiring radicalization of Hamilton’s older brother Nate, who is inspired to lead an activist movement called Coalition for Justice. “The Blood at the Doorstep” is galvanizing in its depiction of Nate, his brother Dameion and his mother Maria turning their struggle with the untimely loss of Dontre into the strength to protect others from the same circumstances they find themselves in, fighting for clarity in an investigation into Dontre’s death that seems to grow more obscured as public scrutiny intensifies. However, with access to law enforcement officials invested in the case, Ljung shows both sides of a highly combustible situation that’s only bound to become more contentious over time. 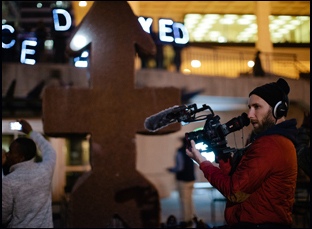 As the film makes its premiere at SXSW, Ljung took an all-too-rare moment away from his editing suite to talk about how he came to make “The Blood is At the Doorstep,” his personal way in to tell this story and his responsibility to the Hamilton family in bringing it to the screen. I live in Milwaukee, so the shooting actually occurred about a mile from my house. It was all over the news here, but it didn’t get a lot of national coverage, and 14 shots in Red Arrow Park, which is a central, very populated downtown Milwaukee park, just didn’t make sense to me, especially since this wasn’t an emergency call. I’ve worked a lot in the past in journalism and documentary work, and I was just curious to know more, so I started going to some rallies.Another thing that really drew me to the story is that I have a cousin I grew up with that has paranoid schizophrenia who is living on the streets off and on, and has had run-ins with police, so from my family’s perspective, I know the challenges of having an adult member with a severe mental illness and what that could be like. So I wanted to show this family’s story from their perspective, what it’s like for a family in the midst of all this. It’s really rare what the Hamilton family did because often times a family that’s thrown into this situation, it’s overwhelming. You don’t know how to engage the media and lot of the times these are apolitical families being thrust in the middle of the media circus and they don’t have the legal experience [either], and they don’t even get a chance to really grieve. 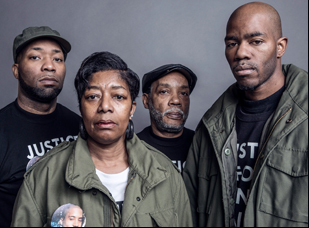 So for us, it was important to just show the family’s story and then for them to lead the organization of a movement in Milwaukee and even expanding that to a national level was really amazing, to have that strength and courage to not only fight their own battle, but also lead a whole community behind them. We had no idea it was going to rise to that level when we started this project. Within the family, you seem to gravitate towards Nate. Did he naturally emerge as a focus for the film? It’s funny. When I first started filming, Maria, the mother, was having obviously a very hard time with this, so she was in the background a lot at a lot of the early rallies, and even Dameion was more of a quiet, behind the scenes kind of guy, so when we were out there, it was always Nate leading these marches, so I gravitated towards him for obvious reasons. But initially, he talked to me and like he says in the film, he led a comfortable life. This is never something he thought he’d be involved in. He didn’t pay attention to the news and he lived his life and he was doing things for himself, but he didn’t really think about the larger community, so this incident really woke him up into a life of social activism. When we were following him, he talked about how when this all went down at first, he didn’t really intend to be the person who led these marches. But the news media was all over the family and he agreed to do this one news interview at the start to be the voice of the family – that’s how it all started for him. Actually, we screened this for the family for the first time last night and Nate was very quiet – he’s very outgoing, funny, and charming, but he was very quiet after the screening and very contemplative. After watching, he said, “There’s still a lot of work that needs to be done,” like he was remotivated to get back out there and start going again. Ferguson happened in the midst of filming this. Did what was going on outside of Milwaukee shape the story you wanted to tell here? As you may have seen if you watched through the end credits, we filmed a lot with Maria, who was involved in the Mothers of the Movement with Hillary Clinton later. It was really compelling to start to film her on that national level and bringing in a more national narrative, but I felt like when we did that it was taking away from the impact of the story here. We felt this is a national story, even though our film is very much on a local and personal level. It speaks to a lot of issues on a national level without explicitly drawing into those themes. There’s a couple references to Ferguson throughout the film as it related to the Hamiltons, but for the most part, we just kept it just within the Hamilton family story because we felt their personal story was in the zeitgeist of what was going on in the country at the time, and Milwaukee and Wisconsin are a kind of litmus test for a lot of things going on in the country right now. There’s renewed scrutiny on police departments and a lot of states are looking at reformative measures. Here in Wisconsin, we have an outside investigation law that Dontre was the very first case in the country to [be a part of], so looking at how that played out in his case and at mental health training for police officers, we touched on a lot of [national] themes. Given the heated environment, I was a little surprised you got a sit-down with Milwaukee Police Chief Edward Flynn. Was access a challenge? I was doing a piece for the New York Times too, so I told him I was doing a feature-length project on the case and this piece for the New York Times and [asked] if he’d be willing to sit down. If it had just been for the film, especially at that time, I don’t think he would’ve been very interested, but being that we’re doing a national story on this too, I think gave it legitimacy and he may have felt like it was better to have his voice than not. The District Attorney’s interview was much further into the filmmaking and [he and Nate] were both at a movie screening for a film called “53206” about black male incarceration in Milwaukee. The district attorney was on the Q & A panel [after the screening] and Nate was in the crowd and he called the DA out in the middle of the audience. It was a sold out screening, there were like 1200 people there, so after the screening, Nate and the DA had a long discussion out in the lobby and I approached the DA then and explained what I was doing. Once I met him in person and he understood where I was coming from, he was pretty open to doing an interview. It was tough to get in front of people, but you explain what you’re trying to do — you’re not trying to do a slam piece, but you’re trying to understand both perspectives of what’s going on here. In some instances in the film, it doesn’t seem like the police and the citizens are disagreeing so much as they’re speaking two entirely different languages. Was that dissonance something difficult to reconcile in putting this together? I think it’s important to show where both groups are coming from because often times the truth is somewhere in the middle. We wanted to make this film for people to understand what it’s like for a family coming from this perspective, but we also wanted to show what this family was facing here in Milwaukee and the differences of opinion that they were facing. It was important for both discussions to be happening and to show that dialogue [because you look for] where can we make some agreement and some changes. In contrasting those two [sides], you let people speak for themselves and the audience can make up their mind about who is right or wrong or maybe they’re both somewhere in the middle. Was making a feature any different than the shorts you had made before? This is insane. This was the hardest thing I’ve ever done in my life, especially since we found out we got into SXSW. We put a lot of work into this film since we found out in late January because there’s still a lot of work to be done, so the last six weeks have taken 10 years off my life. [laughs] We’ve been looking at this every day for like 18 hours a day for the last six weeks, so we haven’t really had a chance to take a breath quite yet until the last couple days, but I’m excited to take a couple steps back and look at it with fresh eyes. A short film is a completely different beast, and dealing with so much footage is overwhelming. I was talking with my editor about, “Let’s add this scene, but make the film shorter.” And it was so hard to lose scenes. The Hamilton family was so proactive and powerful. There’s a credits section, which is like a highlight reel of all the different things we didn’t get to include in the film, but [some cuts] were painful. What really what kept me going was that the Hamilton family trusted me to tell their story and it’s an important story. There are many times where [I thought], “I don’t know if we can do this. Are we the right people to tell this story?” But the Hamilton family trusted us and we had to see this through and make it the most powerful piece we could. “The Blood is at the Doorstep” does not yet have U.S. distribution. It will play at SXSW on March 13th at the Alamo Ritz at 4:30 pm, March 14th at the Alamo Lamar at noon, and March 16th at the Alamo Lamar at 7 pm. SXSW '17 Interview: Jairus McLeary on Going Inside to Do "The Work"
SXSW '17 Review: Christopher Radcliff & Lauren Wolkstein Beguile with "The Strange Ones"